If you're planning to get an iRobot Roomba or Neato Botvac vacuuming robot, and you're undecided as to which brand and model to choose, you might find this article useful. Both companies make a number of vacuuming robots offering features ranging from the most basic to the most sophisticated, the top ones being of course more expensive. In this article, we will compare Roomba 890 with Neato Botvac D80, two very popular robots that come with all the features needed to clean adequately your home, but that are still affordable. Indeed, the two robots to be compared here cost about the same. 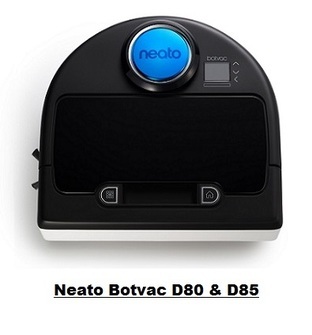 Note that Neato also makes the ​​Botvac D85 robot which has the exact same features as Botvac D80. The only difference is that when you purchase a D85, you get 2 extra replacement filters. In the following text, all features described for Neato D80 apply also to Neato D85. Roomba 890 is a little bit thinner (only 3.6" in height as opposed to the 3.9" for the Neato Botvac D80) which means that it can go better under low lying furniture. The Neato on the other hand, is a little bit narrower (13.2" wide as opposed to 13.9" for the Roomba) and therefore can pass better through narrower passages. Both robots are equipped with a side brush, but because Neato Botvac D80 has a semi-rectangular D-shape, it is reasonable to think that it can be even more efficient in cleaning better wall edges and corners. iRobot's AeroForce technology used in Roomba 890 delivers the ideal balance of vacuum suction and debris extraction: The robot is equipped with counter-rotating dual multi-surface tangle-free brushes (known also as debris extractors) that grab and break down dirt and debris eliminating hair tangles and jams. A spinning side brush cleans along wall edges. In addition, an airflow accelerator creates a sealed channel that concentrates the airflow, sucking in all the debris. Thanks to the high efficiency vacuum created, the air power is increased 5 times in this robot compared to 600 and 700 series Roombas. - a spiral blade brush which combined with Neato's powerful vacuum suction removes easily debris, dirt and fibers from all floor types. - a combo brush which combines the cleaning power of blades and bristles and offers superior pickup of pet hair. - a side brush for thorough edge cleaning which allows the robot to get deep into corners and right up against walls as well as base boards for superior cleaning coverage. iAdapt technology found on Roomba 890 is composed of sophisticated software as well as acoustic and optical sensors, and allows the robot to clean thoroughly the room, making multiple passes, avoiding stairs, getting under and around furniture, and cleaning along wall edges and corners. The low-profile design of the robot allows cleaning under most furniture, and it can automatically adjust to different floor types such as carpet, tile, hardwood and laminate. Note also that in addition to the proximity sensors that detect stairs and surrounding objects, Roomba 890 is equipped with dirt detection sensors that can detect dirtier areas in order to spend more time cleaning them. Neato Botvac D80 is equipped with a laser eye that uses infrared light to scan the surroundings and uses the Simultaneous Localization and Mapping (SLAM) technology to build an accurate map of the room and any obstacles. Using this map, the robot is able to efficiently clean the floor in a pattern of straight and overlapping lines, avoiding obstacles and never missing a spot. The robot can transition with ease between different types of floors, be it hardwood, laminate, tiled or carpeted. To prevent the robot from entering rooms and areas within the room th at are not supposed to be vacuumed, Roomba 890 uses Dual Mode Virtual Wall Barriers which are small, stand alone, battery run devices that can be set to either Virtual Wall mode or to Virtual Wall Halo mode. In Virtual Wall mode the device emits an infra-red beam that the Roomba will not cross. It is used to stop the Roomba from entering rooms that do not need to be cleaned. In Virtual Halo mode, the robot is prevented from entering some restricted area within the room, like for instance the area where the dog food might be. Note that Dual Mode Virtual Wall Barriers require 2 AA batteries that are included. When Roomba 890 is connected via Wi-Fi to your smartphone or tablet, you can use the iRobot Home App for Android and iOS to invoke remotely operations (such as cleaning, scheduling, etc.) from wherever you are, using your smartphone or tablet. Note also that Roomba 890 is compatible with Amazon Alexa and the Google Assistant. Simply ask Alexa or the Google Assistant to start, stop, or dock your robot​. Both robots allow scheduling up to 7 times a week, one cleaning for every day of the week. When the battery gets low, both robots return to the charging base to recharge themselves automatically. After recharging itself, Neato Botvac D80 resumes the vacuuming where it was interrupted before going to home base to recharge. This allows seamless coverage of very large surfaces and entire floors without human intervention. Botvac D80 will do a maximum of three cleaning runs and two recharges between the cleaning runs. After the third cleaning run, it will dock at its home base and recharge. Roomba 890 has to be restarted after the auto-recharge, if more cleaning is required. Spot cleaning allows the robot to focus on a limited area that requires more intense vacuuming. Both robots provide the Spot Clean functionality. Roomba 890 spirals approximately three feet in diameter and then spiral back to where it started, intensely cleaning a localized area. Botvac D80 will first do a boundary cleaning of a (4’ x 6’) area. It will then clean the interior using a back and forth straight-line pattern and return to its starting location. Both robots indicate when the bin gets full. Roomba 890 is equipped with a number of buttons on the robot (see first image below) that allow you to turn on the robot, to invoke a cleaning session, to spot clean and to dock at charging base. The robot is also equipped with a number of status indicators (such as battery indicator, full bin indicator, etc.). Note that scheduling the robot is done using the app from your smartphone or tablet. Neato Botvac D80 is equipped with a small screen (see second image below) that displays various indications (such as the scheduled time, battery level, etc.). The screen has an associated touchpad (with arrows and a selection button) that allows configuration of the robot for scheduling. 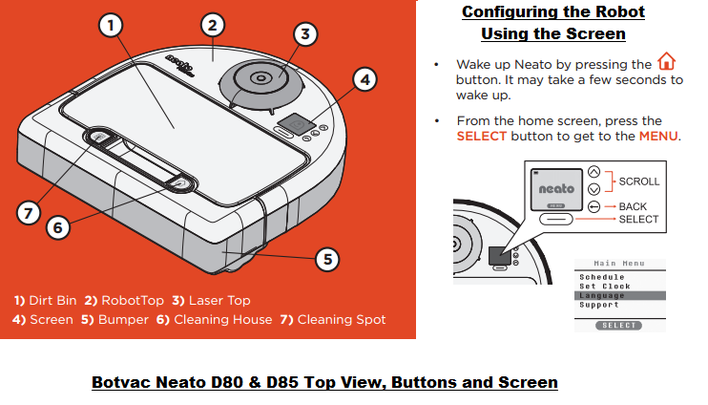 ​Besides the LCD screen, there are two other buttons on the robot: A Power/Clean button used to wake up the robot and initiate a cleaning session, and a Spot Clean button to execute a spot clean. Roomba 890 is equipped with an AeroForce High Efficiency filter that can capture 99% of allergens, pollen, and particles as small as 10 microns. The High-Performance filter found on Neato Botvac D80 can capture particles as small as 0.3 microns. Both types of filters keep the air free of dust, pollen and other particles that can cause allergies. Both types of filters are easy to remove for cleaning. Lithium-Ion batteries provide longer run times than Nickel Metal Hydride (Ni-MH) batteries for a comparable amount of work load, and last longer before needing to be replaced. Roomba 890 can be remotely controlled from your smartphone or tablet from wherever you are, as long as the robot is connected to your home's Wi-Fi. There is no remote control for Neato D80. If you purchase the Neato D85, you get the exact same robot as the D80, with an additional extra two High Performance filters. The Amazon prices shown were in effect at the time this article was written and may have changed. For exact prices, please refer to the Amazon products section below. Note that the Amazon price often includes a generous discount to the list price. If a discount exists, both the Amazon price and the list price will be displayed when you click the Amazon product link images below. 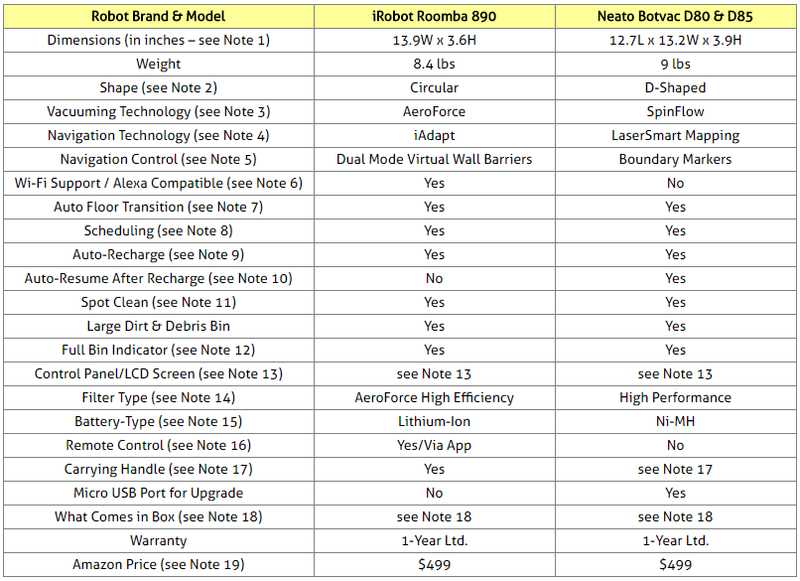 ​So which robot to buy: Neato Botvac D80/D85 or iRobot Roomba 890? Ability to auto recharge when the battery gets low. Powerful filters that clear the air from allergens. Large dirt bins and full bin indications. But these robots also present some important differences, in particular in the way they navigate. Map based SLAM technology (see above for description) that allows intelligent navigation for efficient and seamless vacuuming of an entire floor. Ability to resume the job automatically, without human intervention, where it was interrupted after an auto-recharge. The semi-rectangular D-shape, better adapted to efficiently cleaning wall edges and corners. The combo brush which combines the cleaning power of blades and bristles and offers superior pickup of pet hair. The Boundary Markers (used to stop the robot from entering rooms that do not need to be cleaned) which do not require any batteries. The High-Performance filter that can capture particles as small as 0.3 microns. Existence of a USB port that can be used to upgrade robot's version/features. The Wi-Fi support which allows the robot to be controlled from anywhere using your smartphone or tablet. ​The Dual Mode Virtual Wall Barriers which can be used not just to stop the Roomba from entering rooms that do not need to be cleaned, but also to prevent the robot from entering some restricted area within the room, like for instance the area where the dog food might be. ​The AeroForce High Efficiency filters that can capture 99% of allergens, pollen, and particles. The Lithium-Ion battery that provides longer run times than Nickel Metal Hydride (Ni-MH) batteries for a comparable amount of work load, and last longer before needing to be replaced. The slightly smaller height (thickness) which allows the robot to go easier under lower lying furniture. Note that Amazon often provides a good discount on the List Price of sold products. If a discount is available, the List Price and the actual Amazon price will be shown when you click the images below. ​Have you not found yet what you are looking for?